in all areas of music performance. _The Pope Symphonic Bands have consistently received high ratings at all GMEA festivals and Large Group Performance Evaluations, with the Pope Wind Symphony having received all Superior ratings since its inception in 1987. Symphonic Bands from Pope have performed at area, regional, and national concert events including the South Carolina Conductor’s Conference, the Grand NAI festivals (3 times), the Kennesaw State University Concert Band Festival, the GMEA State Music Conference (4 times), and the Bands of America/Music for All National Concert Festival (4 times). The Pope Marching Band has over 400 awards for excellence, including the prestigious Sudler Shield of Marching Excellence from the John Philip Sousa Foundation. The marching band has been a regional finalist or champion in 16 Bands of America competitions, and a national semi-finalist on two occasions. The Marching Band has appeared in parades across the US and abroad, including the Cotton Bowl Parade, Citrus Bowl Parade, Lord Mayor’s London New Years Parade (twice), and the Waikiki Thanksgiving Parade (3 times). Locally, the marching band has appeared in WSB-TV’s Salute to America Parade, the Children’s Healthcare Parade (4 times), and the annual East Cobber Parade. The Pope Band has been featured in a Longhorn Steakhouse TV commercial, and members of the band were in the Theater of the Stars production run of Disney’s “High School Musical” at the Fox Theater. The Pope Band performed the national anthem for an appearance by President George W. Bush at the Galleria Center. Members of the Pope Band were included as performers when Mr. Gribble was asked to choreograph a portion of the Opening Ceremonies for the 1996 Paralympic Games in Atlanta. The Pope Winter Guard has been a top performer in both circuit and international competition. Pope groups have placed at or near the top in several divisions, being named medalists in both circuit and WGI championships on several occasions. The Pope Indoor Drumline has been a circuit and international participant in competitions, placing in the top three of their classifications and being named division champion in circuit competition. Georgia Honor Organizations are populated by members of the Pope Band year after year. Members of the Pope Band have performed in the GMEA All State Bands and Orchestras every year since Pope opened 26 years ago. Pope consistently places one of the highest percentages of students in District Honor Band of any school in our District. Pope Students also regularly audition for and perform with the Atlanta Symphony Youth Orchestra, The Atlanta Youth Wind Symphony, The Metropolitan Youth Symphony Orchestra, Georgia Youth Symphony Orchestra, Honor Band of Atlanta, and other community groups. Pope Alumni also share a unique status among high school bands in the fact that so many Pope Alumni become music educators. In our band program’s history, over 20 Pope Alumni have earned music education degrees, with at least 17 being current music teachers…8 of them right here in Cobb County! one of the most famous uniforms in the band world! The original Pope Marching Band uniform, designed by Mr. Gribble in 1987, has appeared in numerous movies, TV shows, commercials and videos. After serving for 10 years with the Pope Marching Band, the uniforms were sold to a theater costuming company during filming of "Remember the Titans" in the Atlanta area. 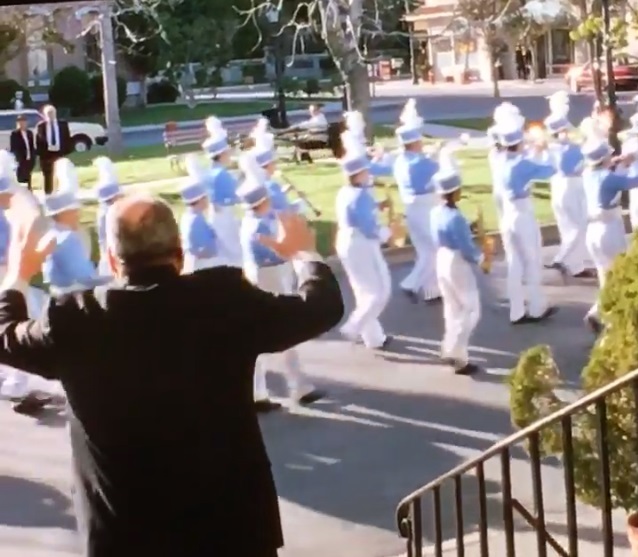 The uniforms appeared in the movie being worn by the visiting band during the big championship game scenes. Later, they appeared in an episode of the TV drama "E.R." when a high school football game turned brawl brought them to the emergency room. 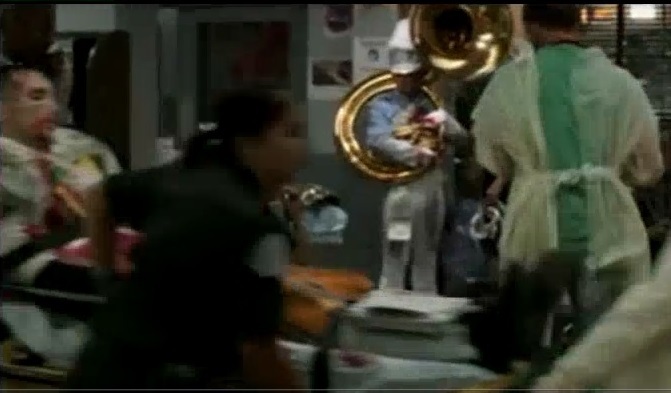 After that, the uniforms appeared in a TV commercial for Energizer batteries, in a scene of a bus ride on a band trip. Eventually, the majority of the uniforms were sold to Disney for an anniversary celebration parade and showed up for sale on E-Bay. Certainly, one of the most famous uniforms in band history!